Born over 100 years ago in Holy Mother Russia and educated under the Soviets, Ayn Rand became the quintessential American writer and philosopher, upholding the supreme value of the individual’s life on earth. She herself led a “rags to riches” life, wrote best-selling novels that championed individualism, and developed a philosophy of reason that validates the American spirit of achievement and independence. The story of Ayn Rand’s life is, in the words of the Oscar-nominated documentary Ayn Rand: A Sense of Life: “a life more compelling than fiction.” Born February 2, 1905, she wrote her first fiction at age 8, when she also showed signs of being an intellectual crusader, vowing to refute a newspaper article claiming that school was the sole source of a child’s ideals. A year later she decided to become a writer: inspired by the hero of a children’s story, who embodied “intelligence directed to a practical purpose,” she had a “blinding picture” of people–not as they are but as they could be. Escaping the tyranny and poverty of the U.S.S.R., she came to America in 1926, officially for a brief visit with relatives. A chance meeting with her favorite American director, Cecil B. DeMille, resulted in jobs as a movie extra and then a junior screenwriter. After periods of near-starvation, she sold her first play to Broadway and her first novel, We the Living, set in the Soviet tyranny she had escaped. With her first best-seller, The Fountainhead in 1943, she presented her ideal man, individualist architect Howard Roark. But it was, she said, “only an overture” to her magnum opus, Atlas Shrugged in 1957, a mystery story about the role of the mind in man’s existence. With Atlas Shrugged her career as a fiction writer ended, but her career as a philosopher had just begun. Her philosophy–Objectivism–upholds objective reality (as opposed to supernaturalism), reason as man’s only means of knowledge (as opposed to faith or skepticism), free will (as opposed to determinism–by biology or environment), and an ethics of rational self-interest (as opposed to the sacrifice of oneself to others or others to self). The only moral political system, she maintained, is laissez-faire capitalism (as opposed to the collectivism of socialism, fascism, or the welfare state), because it recognizes the inalienable right of an individual to act on the judgment of his own mind. Your life, she held, belongs to you and not to your country, God or your neighbors. 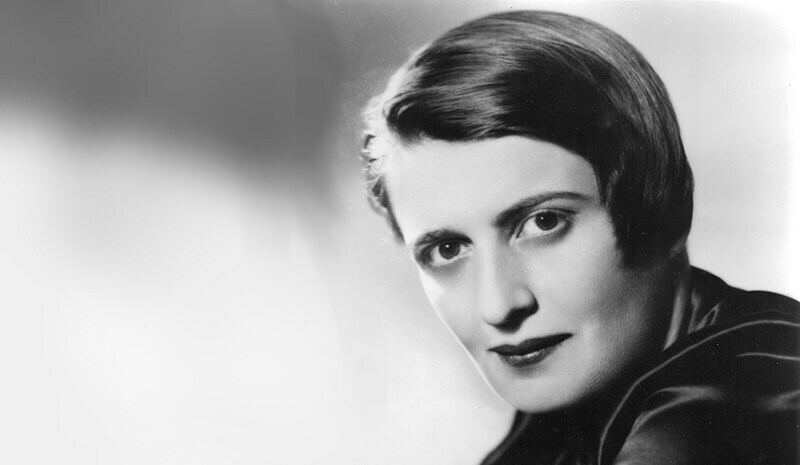 Ayn Rand understood that to defend the individual she must penetrate to the root: his need to use reason to survive. “I am not primarily an advocate of capitalism,” she wrote in 1971, “but of egoism; and I am not primarily an advocate of egoism, but of reason. If one recognizes the supremacy of reason and applies it consistently, all the rest follows.” This radical view put her at odds with conservatives, whom she vilified for their attempts to base capitalism on faith and altruism. Advocating a government to protect the individual’s right to his property, she was not a liberal (or an anarchist). Advocating the indispensability of philosophy, she was not a libertarian. Despite being outside the cultural mainstream, her novels became best-sellers and her books sell more today than ever before–half a million copies per year. There is a reason that Atlas Shrugged placed second in a Library of Congress survey about most influential books. There is a reason that her works are considered life-altering by so many readers. She had an exalted view of man and created inspiring fictional heroes. A sui generis philosopher, who looked at the world anew, Ayn Rand has long puzzled the intellectual establishment. Academia has usually met her views with antagonism or avoidance, unable to fathom that she was an individualist but not a subjectivist, an absolutist but not a dogmatist. And they have thus ignored her original solutions to such seemingly intractable problems as how to ground values in facts. But even in academia her ideas are finding more acceptance, e.g., university fellowships and a subgroup within the American Philosophical Association to study Objectivism. Ayn Rand left a legacy in defense of reason and freedom that serves as a guidepost for the American spirit–especially pertinent today when America and what it stands for are under assault. Dr. Berliner is the senior advisor to the Ayn Rand Archives. He was the executive director of the Ayn Rand Institute from its founding to January 2000.